Icon Audio unveils first stereo valve power amp | What Hi-Fi? Icon Audio's new Stereo 60P MkIIIm is the company's first stereo power amplifier and represents valve power in its purest form, with no input selection, no volume control, and an input socket that connects directly to the grid of the first valve. 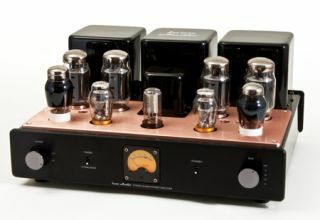 The Stereo 60P MkIIIm uses four KT120 valves which, when combined with its large power supply and Low Distortion Tertiary (LDT) output transformers, deliver 80W per channel. As some users may prefer triode operation, the power amp can switch from an ultralinear 80W-per-channel amplifier to a 40W triode amp at the flick of a switch. In addition, the LDT transformers have been optimised for both settings, ensuring that the highest quality sound is achieved at all times, the company claims. The Stereo 60P MkIIIm also comes with a built-in bias meter, intended to keep the amplifier running at peak performance. The standard ST60P MkIIIm is available now for £2200. A special edition 'David Shaw Signature' model with Jensen copper foil oil-in-paper capacitors and premium valves costs £2680.